If you’re flying like a pro, you’re only taking carry-on luggage when you fly. Its easy, you’re the first out of the airport, and there’s no risk of lost luggage. Unfortunately, all great things come at a cost. The cost here is the weight limit on budget airlines. I find it very difficult to keep my bag under 7kg, especially with my laptop, chargers, and clothes. I’ve flown on many budget airlines and recently I was turned away at the check-in desk because my bag was 2kg over the limit. I was literally told to put all my clothes on from my bag so it would be under the limit. I found this very odd as it’s still going on the plane.. I have a couple clever solutions below that I’ve used to bypass the limit. Traveling with friends is great. Especially when you can use their help to get your overweight bags onto the plane. The first way is to simply ask them to put your heavy laptop or souvenirs in their bag, so your bag is under-weight. But wait, what if they are shop-a-holics and their bags are overweight too? Instead, have someone in your group find a nice spot to sit and give them all your heavy goods. Then go collect your boarding pass, and meet up with them after to re-collect your goods and do the same for them. This way everyone can get their boarding pass even though everyone’s bags are overweight. But wait, you’re a solo traveler. What do you do? Put your stuff in a locker! There’s usually storage lockers just outside of security. It might cost a few dollars/pounds/rupees/ringgits/pebbles, but it would probably still be cheaper than the check-in charge. If you really don’t want to use a locker, and are solo, then maybe find someone that looks friendly and ask them to hold onto your clothes or something non-valuable. Make them feel at ease by showing them inside your bag. Reward them with lounge access as your guest (if you’re a VIP). Most airlines will only weigh your carry-on bags if you go to the check-in counter to get your boarding pass. You can usually bypass this entirely just by getting your boarding pass via your mobile phone. Not all airlines allow this (looking at you VietJet [International Flights]), but if you can get the mobile pass, then chances are you’ll never have your bag weighed. Just don’t go overboard and try to bring on a full-size suitcase as your carry on. 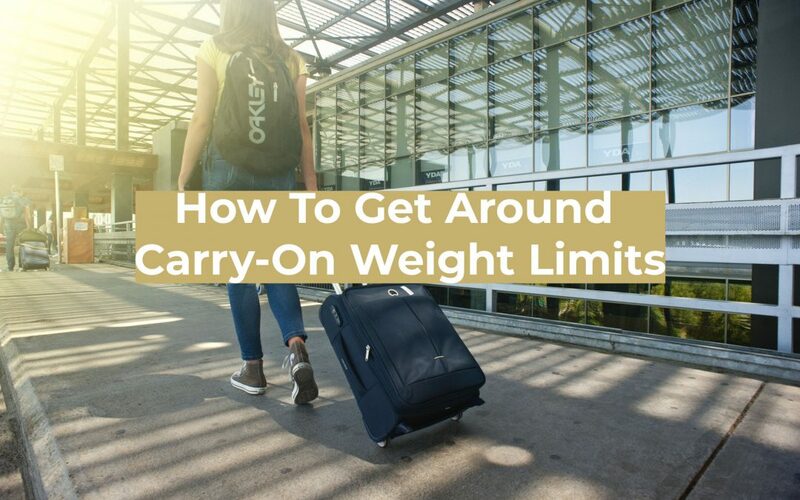 This obviously won’t always work, particularly if your bag is HUGE, but if your bag is the right dimensions for carry-on and only a few kg over, then give it a shot. Most airlines won’t weigh your bags at the gate. If you get caught, just admit it and pay up, you’re already getting a great deal on that budget airline. If you get re-weighed at the gate, hey, maybe you bought a bunch of souvenirs. What tricks have you used to bypass the weight limit? Let me know in the comments and I’ll add it to the list.